Check out my video breakdown of Washington cornerback Byron Murphy. Note: After pressing play, click on the arrows at the bottom-right corner of the video to make it full screen. 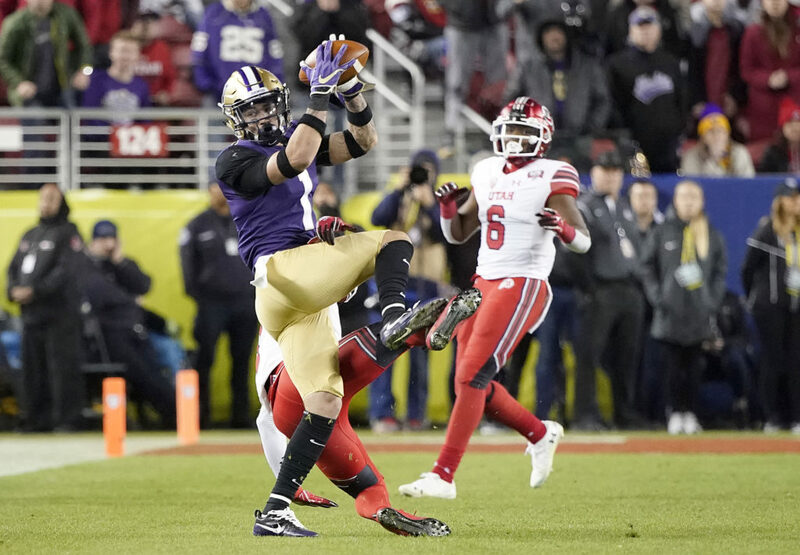 The strengths and weaknesses of Washington CB Byron Murphy. For our defense he’s my #1 corner, and would immediately supplant Witherspoon. Two more of his strengths to go along with Grant’s excellent video breakdown’s are his striking power, and route recognition. If he were just a little longer, and faster he’d be a perfect fit. As he is, he’d be an excellent fit but he’ll be long gone before #36…. Nice. Smart, can lay the wood, can turn back and track the ball, and jumps routes. Number 2 on Stanford is Trenton Irwin. Niners may want to select Mecole Hardman with his 4.33 speed, and covert him back to CB. Will move this to this thread. Jonathan Delmark’s part 2 on Solomon Thomas. Really highlights why the 49ers should have no fear making him a full time DT. He is good against the run no matter where he lines up. And part 1 showed he is a pretty good pass rusher inside in one-on-one situations. Delmark does get a bit confused between Sheldon Day and DJ Jones though. At the end he is praising the work of Day, but that is Jones. Day wasn’t even active at the end of the year. Something I found interesting in these vids is that Buckner is at DE a bit. These vids mostly show towards the end of last season. Will be curious to see if this is something they look to continue with moving forward. I saw that. Thanks for posting. Thomas may never play up to his draft status, but he’s a valuable part if our defense. Yah, I caught that also Scooter. I agree that Thomas’ best fit is on the interior, but where is he in the rotation? The 49ers have better DT’s, IMO, so I don’t know what to do with him? My only problem with the series is it’s basically a highlight reel with commentary. It does showcase reasons for optimism but it’s certainly not a full picture. I could essentially do the same thing with Armstead, Blair or any other player on the line but it doesn’t show anything close to a full picture. It’s not a ‘problem at all’ if it’s not the full picture and of course it isn’t. Who expects a whole picture?. Nobody expects it to be. It’s a great insight why the player ‘may or my not’ be a fit by Grant. It’s ‘not’ just only a highlight, the good and bad. It’s more than what we’ve had in the past years, better than nothing. I was referring to the Jonathan Delmark series on ST, not Grant’s breakdown. It’s kind of a cop out because they both went to the same college, but Murphy reminds me of Marcus Peters as a player. Both very instinctive ball hawks that aren’t the best athletes (though not terrible by any means) that can be caught gambling. I really like him. He is my second rated CB in the draft behind Baker and not much between them. I just think Baker is a little more well rounded and savvy. I am not considering potential character concerns in that – there are rumours Baker may not be a great teammate. If the 49ers trade back and get a pick in the mid first round (hi there, Giants) I could see one of those two CBs being of real interest. Cop Out was a funny movie. Peters was my comparison for Murphy’s Law as well, so maybe it’s not that big of a duck-shove. I agree with the Peters comparison, but Murphy is a better tackler. Who does Baker remind you of? Any questions about a CB with short arms, who played at or around 170 lbs in college, put on 15-20 lbs for the combine, and then clearly struggled to handle that extra weight at that combine? It is for me. He’s clearly a talented, instinctive CB, no question about that, but can he play at a high level at 190 lbs for the NFL, if his natural weight is closer to 175-180 lbs soaking wet? I’m not sure. Good question. Maybe Aeneas Williams? Obviously has to prove himself in the NFL before such lofty comparisons should be made, but I see that kind of awareness, understanding of technique and physicality in his game. Whoa Scooter … Aeneas Williams? Pump the brakes bro, lol. Dang though, I do think there are similarities for sure. Aeneas is certainly living proof that you don’t need to be the biggest or the fastest to be a ball hawking, shut down corner. I haven’t been able to view your previous breakdowns on the WRs because the clips will freeze or not load, so I am glad I was able to view this breakdown. Murphy is the CB prospect that I believe would excel with Woods as his coach, and he would definitely be a great option in a trade down. While he does not have good recovery speed, his overall ability to read and react thanks in part to his instinctive and fluid hips keep that from being a major concern. I do have to disagree with Scooter’s take of comparing Murphy to Peters because I believe Murphy is more instinctively sound than Peters but lacks the extra gear Peters has. Murphy’s combine draft compared him to Brent Grimes, which is an assessment that I agree with. Overall, I do agree with your take on his fit with the team, but one of the areas of concern that showed up in one of the videos that highlighted his strengths was getting too grabby with a WR that has beaten him in order to try to keep up with him. Other than that, it was an excellent breakdown Grant. Hey, the Niners signed Verrett, so all are worries are gone, right? Wrong. Verrett has only played in 25 out of a possible 80 games the past 5 years. Why? He keeps getting injured. He is just a bandade ready to break. I was trying to be funny, but that went right over your head. Yes, I hope the Niners draft a CB in this draft, because Verrett is injury prone, and Witherspoon has not learned to turn his head and track the ball.